The MD3183 T3 Inflatable PFD with HIT (Hydrostatic Inflator Technology) is Mustang Survival's top-of-the-line inflatable PFD. Constructed of ANSI approved high visibility materials. This PFD is worn by police, EMS and traffic controllers. The MD3183 T3 is our brightest inflatable yet.The Hydrostatic Inflator Technology offers reliable inflation in a low maintenance design that will only automatically inflate when submerged in 4 or more inches of water and not inadvertently due to rain, spray or humidity. 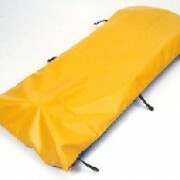 Exclusive to Mustang Survival in North America and maintenance-free for 5 years or until inflated. Made for the most severe marine environments the Inflatable PFD with HIT will meet the challenges of the most demanding users. 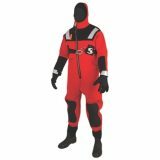 It also features the patented SecureZip™ closure system to ensure the PFD will stay closed during even the most rigorous activity and still opens effortlessly upon inflation. This low profile PFD ensures high visibility and is lightweight and comfortable enough that you'll forget you're wearing a PFD! The MD3183 T3 can be custom-screened for company or agency identification. For the highest visibility and to comply with ANSI 107-2004 Class 2 standards, simply wear the MD3183 T3 with a Diamond Rubber Products 8972 mesh vest. Protective storage bag for Ice Rescue Shuttle. Features lash-down carry handles, opened by hook & loop closure flap. Specify color: Blue, Red, or Yellow.